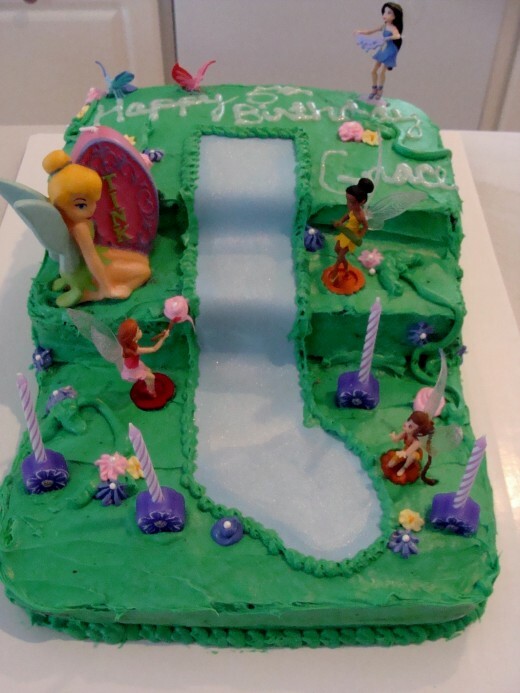 Making a Tinkerbell cake for your child's birthday or for any other celebration can be easy and fun. 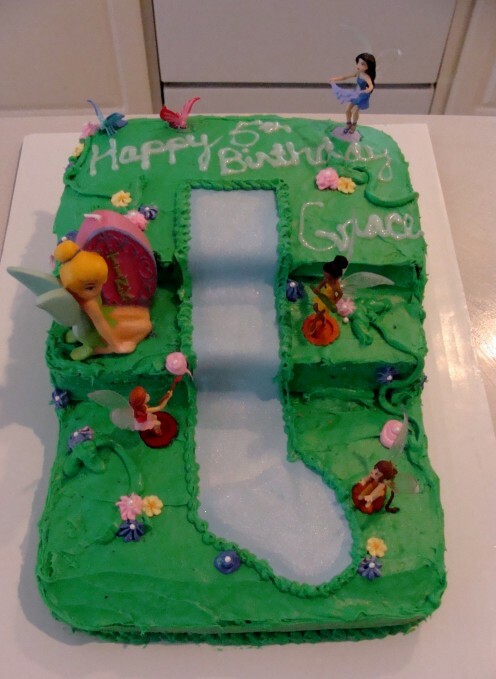 When my daughter said that she wanted a Tinkerbell birthday party, my mind began to imagine the possibilities of what kind of cake I would make for her. There are a lot of options to choose from. You could make a cake that shows just Tinkerbell's face or her whole body. 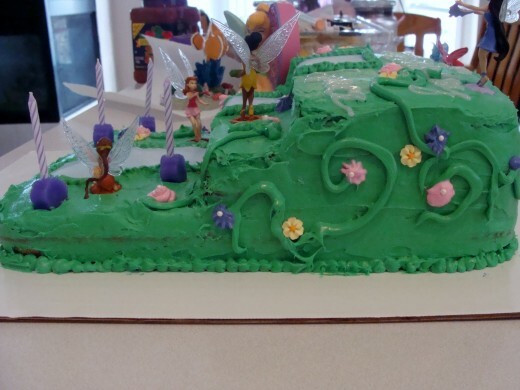 You could make a sheet cake that depicts a scene with Tinkerbell in it. You could even keep it really simple and just make cupcakes that are decorated with Tinkerbell decorations. Since most of the Tinkerbell shows and cartoons now involve Tinkerbell in Pixie Hollow, I decided that I wanted her cake to represent this image. Here is how I did it. Photo guide of stacking the cake. I did not bake my cake from scratch. Due to time elements, I used box cake mixes. However, if you want to make your cake from scratch, you can find a great recipe here. I used two cake mixes and two different flavors per the birthday girl's request, to make this cake. 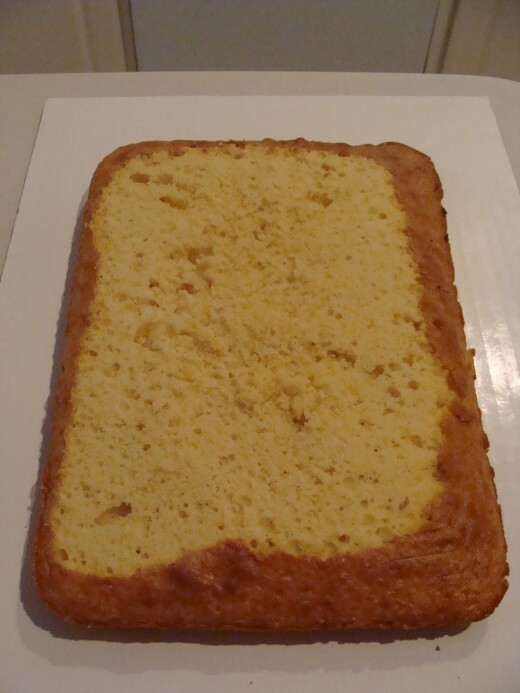 I baked both cakes in a 9x13 inch pan according to package directions. Make sure that you allow the cakes to completely cool before you attempt to do anything else with the cakes. 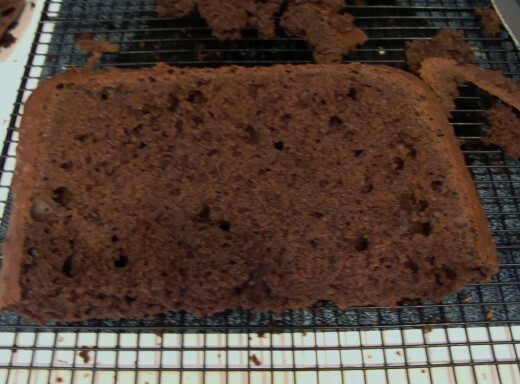 Once the cakes are completely cooled, place a tray or a cooling rack over the top of the cake upside down. Then flip the cake pan over onto the tray so that they cake will come out of the cake pan easily and without breaking. Repeat the process with the other cake. Next, turn your bottom layer of your cake over so that it is right side up and carefully slice the top of the cake so that it is flat. This is necessary to have your layers lie flat upon each other and not round over. Choose which cake will represent your top two layers and cut the cake so that it is in two pieces. 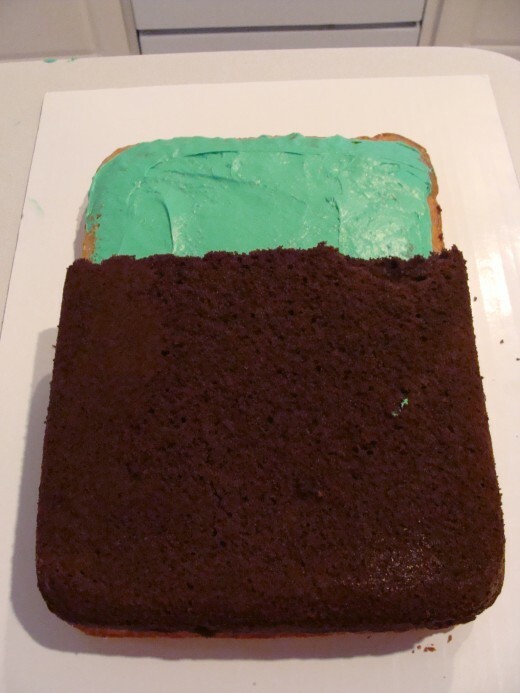 The pieces should be about 3/4 of the cake for one piece and 1/4 of the cake for the top layer. Then take your bottom layer for your cake and place it on the cardboard or what ever the serving tray is that you will be using. You will now be using this as your working surface so that once it is frosted and decorated, you will not need to move it again. 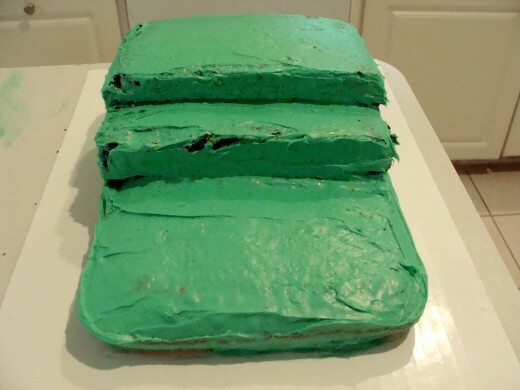 Frost the bottom layer of your cake so that you can place the next layer on top of the first. Place your second layer inverted on top of the first (bottom) layer. 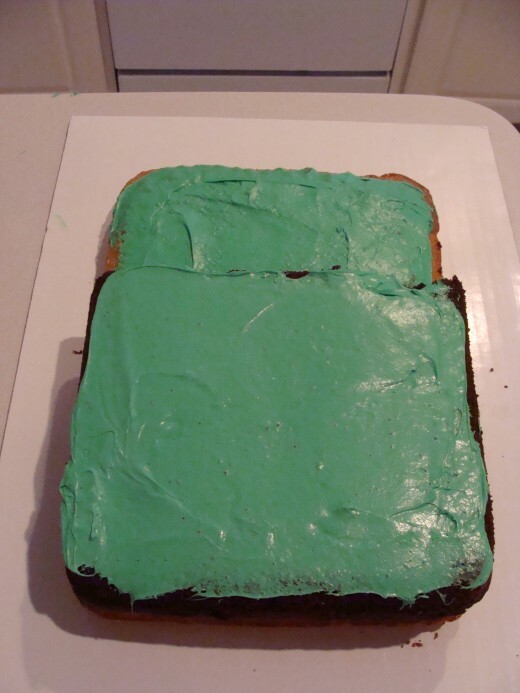 Continue by frosting this layer. 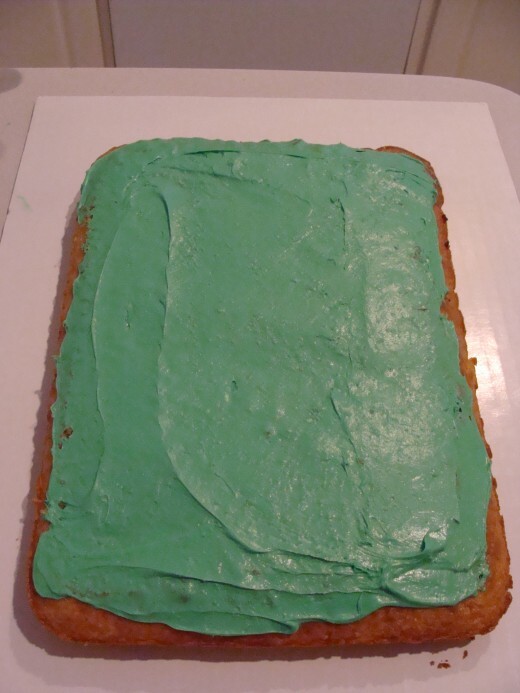 Finally invert the top layer onto the second layer and completely frost the cake. This layer is called the crumb layer. You will find that it is not neat but will be filled with pieces of the cake. This will eventually be covered with the final layer of frosting. Allow the frosting to set for about an hour. This works best if you can place it in the refrigerator or freezer to set. Photos of creating the waterfall. Start by frosting the entire cake with another thick layer of frosting. This should be your final layer of frosting. Be sure that you have smoothed the frosting out so that it looks uniform. 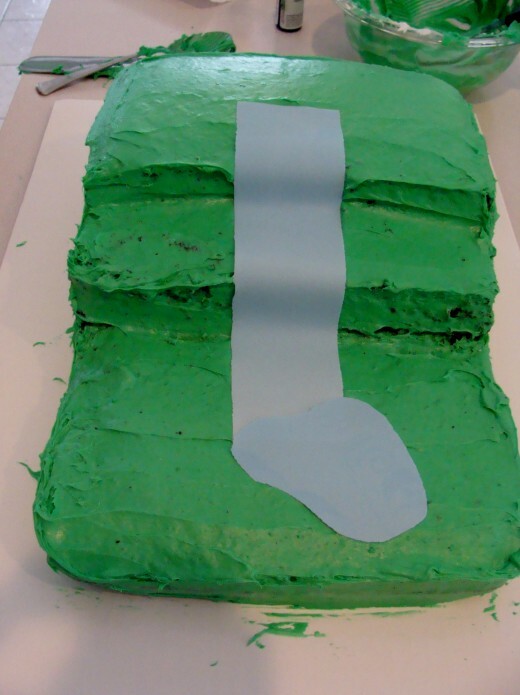 Once the frosting is complete, you can place the waterfall where you would like it to flow. 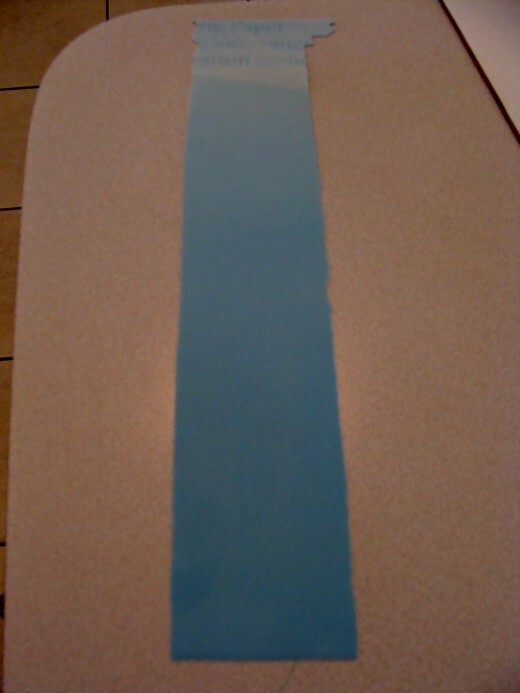 I used a blue sugar sheet and cut it out in the shape that I liked. I simply made a straight, rectangular cut for the actual falls and then cut a wavy circular shape to represent the pond. This was the first time I had ever used the sugar sheet and I found it very easy to work with. Next you can begin creating the leaves and vines on the cake. You can do this by using a piping bag full of green frosting as well as a round tip. 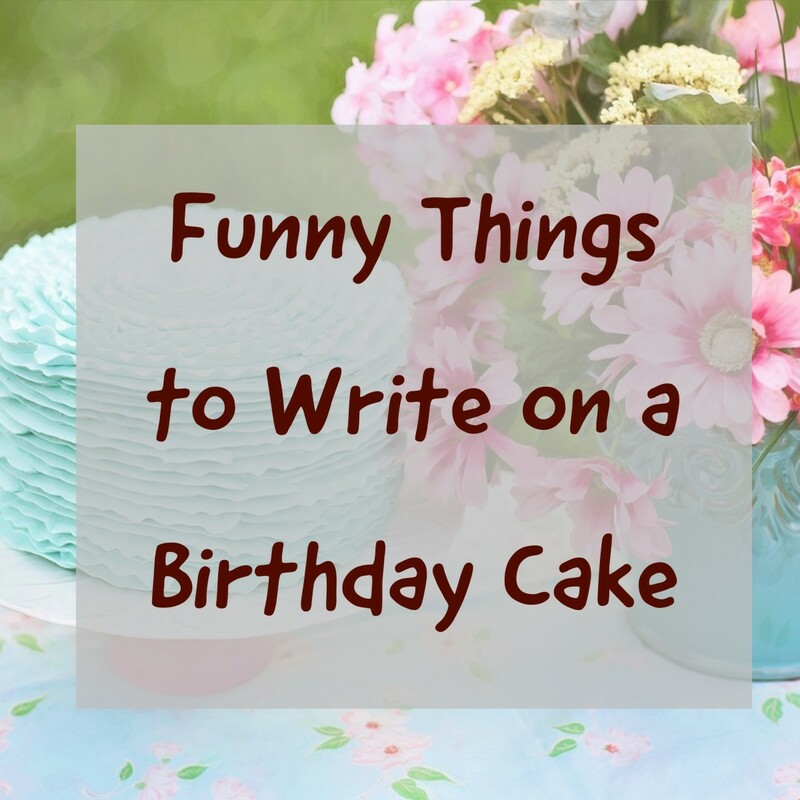 Create vines by piping swirling lines and circles around the top and sides of the cake. 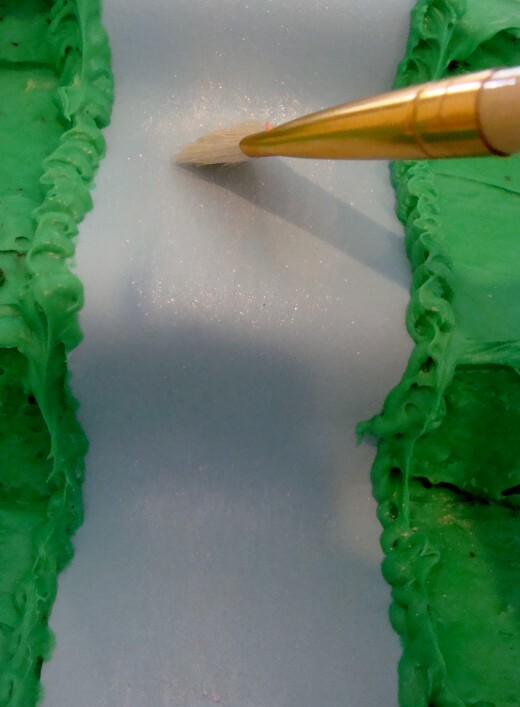 I also used this tip to pipe green dots around the water to add a nice border. Changes tips to a flat tip to make the leaves. I also touched up any spots that I thought needed to be covered because the frosting layer was not smooth or needed to be spruced up. There were a couple of spots that I was not happy with and I used the added leaves and flowers to cover those flaws. 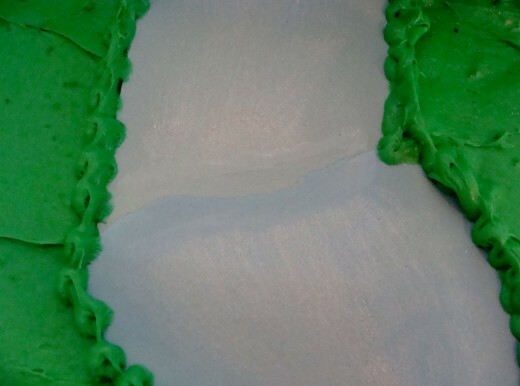 Once you have piped all of the green parts of the cake, change colors of frosting for the flowers. You can certainly use any colors that the birthday girl likes. Adding a variety of colors makes it very appealing to the eye. You will also need to change tips to make the flowers. Make sure that you leave room to pipe a birthday message for the birthday girl somewhere on the cake. 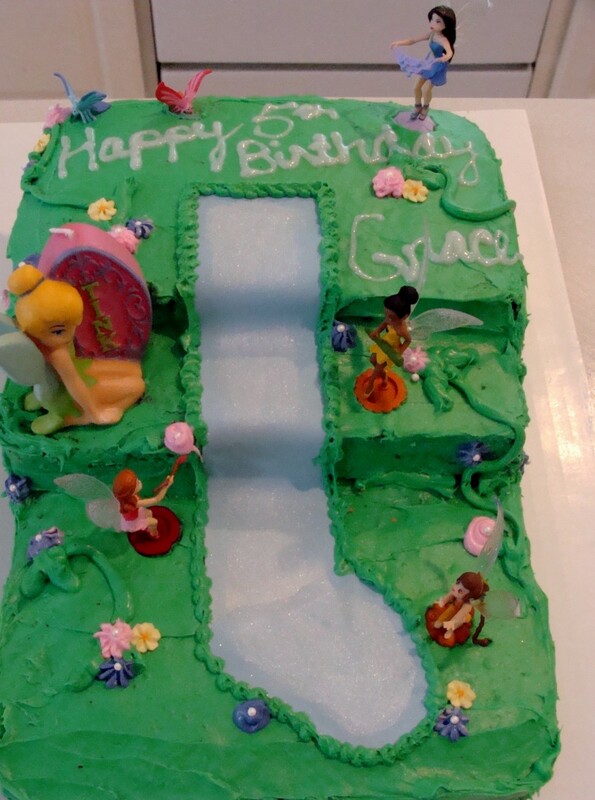 For the finishing touches, add some of the fairies from Tinkerbell to the cake. I simply purchased some small figures, washed and dried them and added them to the cake. I added a Tinkerbell candle and the cake was complete. Sugar sheets come in a variety of colors and designs. How does the ease and look of this cake appeal to you? I am definitely not a professional baker and have only attempted one other "complicated" birthday cake previously. I can say that it is not very hard to do and can be a lot of fun as well. Even if it does not turn out "perfect," trust me when I say that the birthday girl will love the effort that you put into making a homemade cake for her. Thanks, she was a very happy little girl! That's a really awesome looking cake...I bet you made a little girl happy...looks so, by the smile on her face. Thanks kikalin for the forward to your friend. I hope that it gives her some inspiration. Thanks for reading and commenting! Fantastic learner365, I'm so glad that you found it useful. Let me know how it turns out. What a pretty cake. Will be forwarding this to a friend for ideas. Thanks for sharing! Very nice and creative.I love baking and i am always looking forward to creative ideas like these. Thank you for sharing.I will look forward to try this out !!! Sure! I am sure she will be very happy :). Thanks again! When you do please take pictures and share! I would love to see her face. :) Thanks for reading and commenting. My niece loves Tinkerbell. I think the next time I go to India to visit, I will have to make her this cake. 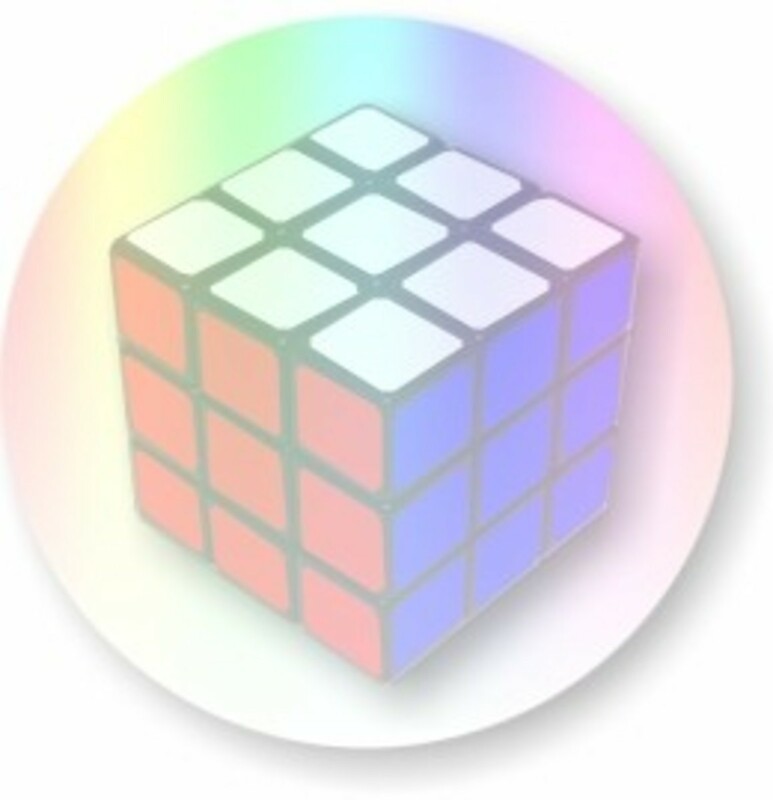 Thank you so much for sharing how to make this! This is very creative and beautiful. I think it is great to make customized cakes to really make the birthday girl feel special. Voted up and shared. Thanks pmccray, glad you enjoyed it! Awww, nice mom, cute cake, sweet birthday girl! Great idea for a cake design and very creative. Voted up! She did randomcreative, thanks! I appreciate your comments. Thanks teaches 12345, it was very easy. Really easy for the "average" baker to make. Your cake turned out beautifully! Thanks for the great instructions. I hope that your daughter had a wonderful birthday. What a sweet child and a yummy-looking cake. Very creative, yet a simple technique in baking this cake. LOL, no it's ok, I'm over that! Thanks for the link and I'm glad you liked it. 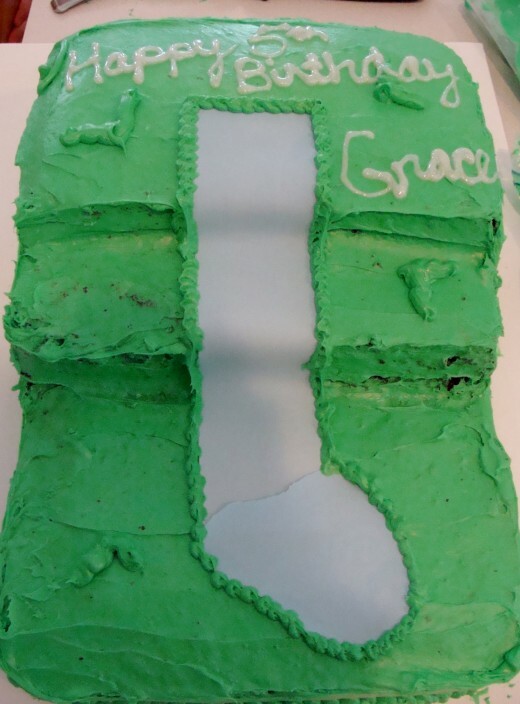 Thanks for the link to Grace's birthday poem. You are one clever mama! Voted it up and awesome. BTW-I linked my poem to your party hub here under the words: Happy Birthday. Awesome instantlyfamily! I love when my hubs inspire others. I would love to hear how it turns out, keep me posted! Thanks so much Leah it was fun to make. Grace's eyes just absolutely lit up when she saw it. I had to laugh at your Star Wars cake idea because my son is now into Star Wars. I think it's a great idea! You did such a great job! 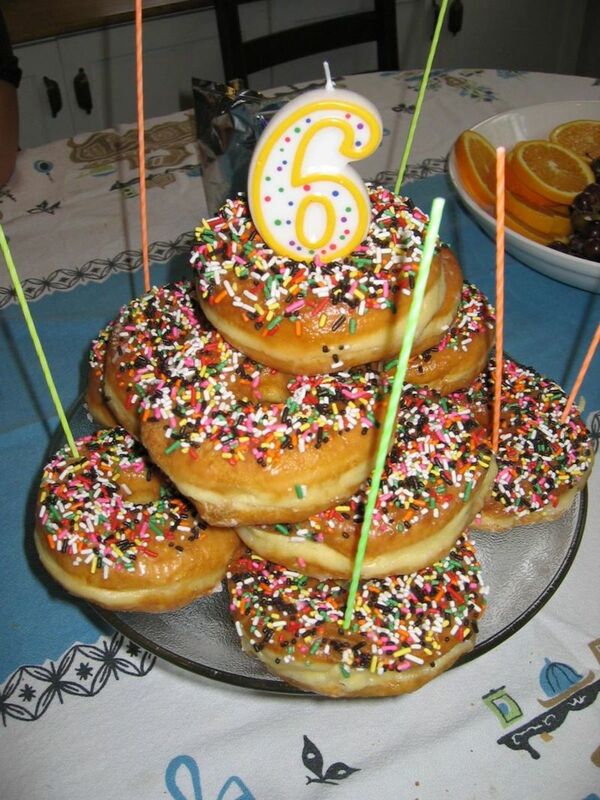 You have also inspired me to make my childs next birthday cake! Thank you so much! I have bookmarked this. I will let you know how it turns out! Oh my goodness, that cake is SO adorable! This gives me girl envy, lol. I bet I could adapt the cake to fit a Star Wars theme, though - the "river" could be turned into hot lava and Tinkerbell could be replaced with storm troopers. Haha! 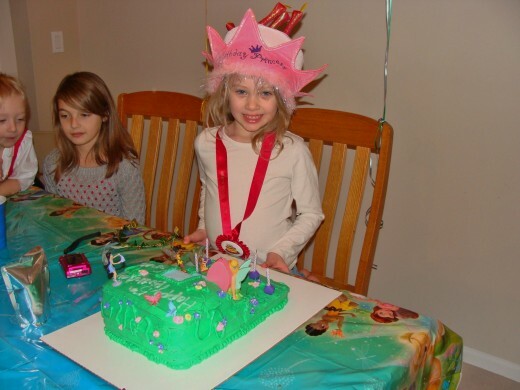 Still, I wish we had a little girl in the house - that Tinkerbell cake is CUTE! Thanks for the comments and birthday wishes ishwaryaa22. So glad that you enjoyed it. Thanks Anil and Honey. I guess it is useful for a housewife (even though I'm a working mom) as well as a house husband! Thanks for the kind comments asmaiftikhar. I enjoy baking but only recently have tried to be a little more creative with my cakes. a tasty hub with the colors of creativity.Baking is a creative art but you add more creative colors and make it worth praising.Thanks for sharing. It is very useful to a housewife. Very Creative Indeed! The way you stacked up the cake-layers of different flavours, using blue sugar sheet for waterfall, frosting the cake, covering the spots with flowers and leaves and all are very impressive! My Belated Birthday Wishes to your daughter. Awesome and Beautiful! Vote Up.